Experiencing a virtual reality roller coaster ride in Shenzhen. I recently went on a trip to China (specifically, Shanghai and Shenzhen, China's burgeoning tech center located just across the border from Hong Kong) where I got to see and experience some of the latest technological innovations being implemented in the world's second-largest economy. In many areas, China has leapt ahead of the U.S. and other Western countries, having taken advantage of its massive domestic user base to create new technologies, services and business models. While some of these models are replicable in the West, many are unique to the Chinese market, with some observers noting that there exist almost two different massive internets in the world -- one in the U.S. and one in China -- which has a host of implications for investors. You often hear about how far ahead China is when it comes to digital/mobile payments and I can attest that that's true. Using physical money is rare, and you can, and often must, pay for everything using Tencent's (TCEHY WeChat Pay or Alibaba's (BABA - Get Report) Alipay -- that goes for coffee, restaurant meals, groceries, utility bills, sending money to friends and family, you-name-it. Many Chinese street vendors accept mobile payments, and securing and paying for a taxi has been difficult for some time now in Shanghai without using a smartphone app. At a café in Shenzhen, I even saw a kiosk that used facial recognition to verify a customer's identity so they could make a payment. 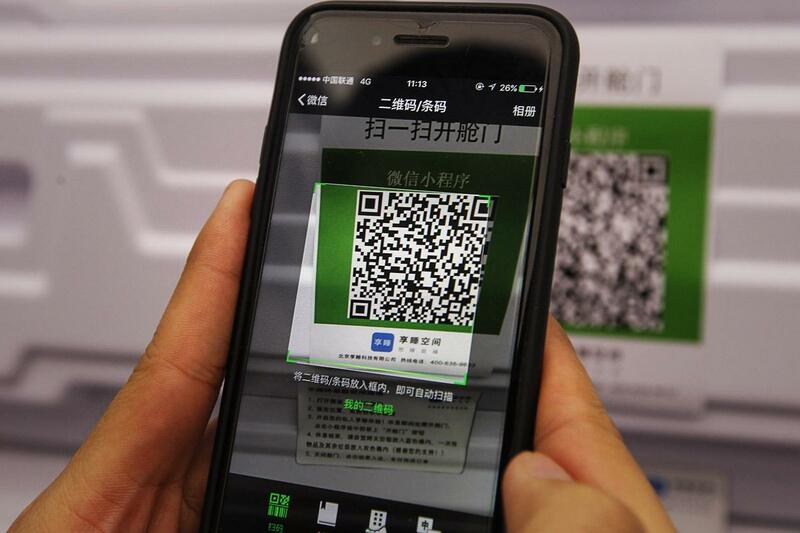 A Chinese consumer using a QR code to make a payment. Notably, at a restaurant I went to in Shenzhen with some friends, the establishment's entire menu was online, and we did all our ordering and payment via an app owned by Alibaba called Koubei (the name means "word of mouth" in Mandarin). Using Koubei obviously saves the restaurant some time in relaying orders, but it also gives both Koubei and the restaurant tons of data about what you've ordered in the past, and ways to entice you to return in the future. More and more restaurants in China are using Koubei and similar apps for these reasons. 2. Other areas, including robots and VR, are catching up to the U.S. -- and ahead of it in many ways. China may not be as strong yet as the U.S. in developing core transformative technologies, but the country has become incredibly adept at building applications and products on top of the latest technologies. "China is cranking out a lot of people with the nuts-and-bolt experience to take the latest AI research and apply it," Martin Ford, futurist, AI expert and author of Architects of Intelligence told me. Add to that people power the massive amounts of usage data that Chinese companies are gathering, and Ford says "they may well pull ahead of us." Two examples I saw of this application wizardry were Chinese electric carmaker Nio's (NIO dashboard-mounted digital assistant, and a virtual reality roller coaster ride, both of which I experienced while I was in the new Ping An Finance Centre in Shenzhen (the building opened in 2017 and is the world's fourth-tallest building at 1,965 feet). Nio, the ambitious Chinese electric carmaker that's drawn comparisons to Tesla, started making a slick-looking electric SUV in 2018 that's only available in China. In a demo space very reminiscent of an Apple Store set up on the ground floor of the Finance Centre, I got to sit in the driver's seat of its ES8, which sells for the equivalent of about $80,000, with the Chinese government subsidizing some of its cost. Aside from the comfortable interior and minimalist design, the ES8's most noticeable feature is Nomi, which Nio calls an "in-car intelligent AI system." The assistant is housed in a small circular device on the dashboard that looks like an Echo Spot. But Nomi can swivel around to point its camera and also match the simple facial expressions that appear on its screen. Among the tasks it can perform are to recognize and greet you, take selfies, play song requests and answer questions. While Nomi feels like more of a cute gimmick now than an essential car feature, Nio's engineers will undoubtedly keep improving it, and I could see it becoming much more useful in the future -- after all, using voice and affect are probably the best ways to convey information to drivers who need to have hands on the steering wheel (things may be different in the autonomous future, of course). While I haven't tried comparable VR set-ups in the U.S., this virtual reality coaster ride left me feeling very impressed and slightly unnerved. And given its triggering of my fear of heights, I could see one very powerful application being to help people with different phobias deal with their fears in a safe environment and gradually start to overcome them. While U.S. investors hear a lot more Alibaba since it's traded on the NYSE, Tencent is China's other tech giant and it is ubiquitous. Tencent makes the incredibly popular WeChat messaging payments and social media platform, which counts more than a billion monthly active users in China. It's also China's top maker of online video games, and runs the leading streaming video business, Tencent Video. The company has also taken minority stakes in hundreds of promising tech companies around the world, including Fortnite creator Epic Games, Tesla, Snap and recently, Reddit -- in order to keep tabs on promising technologies and talent. I went by Tencent's massive new headquarters in Shenzhen and while I wasn't able to have an official visit with the company, I did get a good feel for the company and how pervasive its services are in China. According to its latest quarterly reports and briefings, Tencent is trying to leverage WeChat's massive popularity for its efforts to get into enterprise services, especially cloud and payments services, by promoting the knowledge of their businesses that comes from the popularity of WeChat among their consumers. 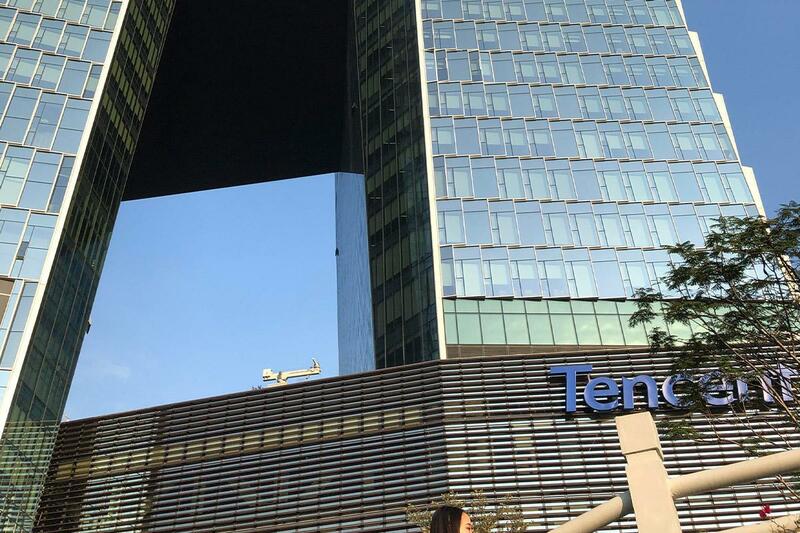 Tencent's massive new headquarters in Shenzhen. Tencent has also been diversifying away from its reliance on video games, which historically has accounted for the majority of its revenues. That reliance hurt the company's stock significantly in 2018 as the Chinese government temporarily halted approving the monetization of new games because of concerns about the Chinese population, especially children, becoming addicted to them. However, online games have now gone from 59% of Tencent's total revenues at the beginning of 2015 to 32% in the third quarter of 2018, with revenues from online advertising, payments technology and cloud services growing more quickly than games. As has been noted by Stratechery's Ben Thompson, WeChat's popularity in China is one reason that Apple's (AAPL - Get Report) ecosystem is not nearly as sticky in China as it is in other areas of the world. The app, which is available for both iOS and Android, can do so many things -- from digital payments to transactions and communications with businesses to accessing government services -- that in many ways, WeChat IS the mobile operating system for many Chinese smartphone users. Overall, China's technological progress has been impressive, although that advancement comes with concerns that are not just limited to the country's growing rivalry with the U.S.
"It's not just a question of technology, but politics and culture, too. As China becomes more advanced, their cultural values will also get projected, and there's the potential for this technology to be very Orwellian," said Ford, citing the facial recognition systems being developed in China and being used there and elsewhere. Time will tell how quickly and in what direction China's impressive high-tech prowess will develop, and its implications for U.S. tech giants and the world at large.